This is where your handbag magic begins! As a mid-size Base, the Classic can easily carry a wallet, glasses, keys and other small necessities as you go through your busy day. Reinforced solid side construction and sturdy top zipper . 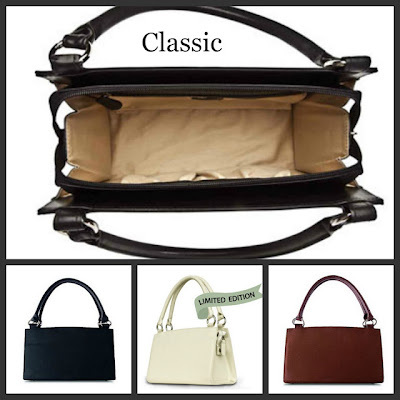 Beige fabric interior includes two open elastic pockets and one full-length zippered pocket. The Classic Base Bag works with all Classic Shells.The Handles pictured come with the Bag and are 16 3/4" long and 3/4" wide, with a 7" handle drop. Bag dimensions 5.75" (wide) x 11.75" (long) x 6.5" (tall).